Thought that seeing as i had my laptop in mums shop today i would take some photos of my ensemble. Not that you can really see it but i had a sequin long, baggy top, cropped black blazer and jeggings. 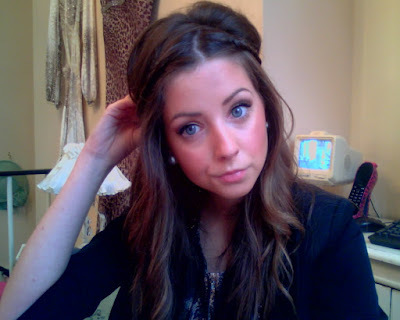 My hair was tousled and plaited at the sides & my makeup was just simple. Please excuse the fact i look like i've had 2 hours of sleep...i cant seem to look awake anymore...even after a good nights sleep. P.s. Look at the phone i have to answer...yes, its a pink spotty stilleto..
Im going to start getting into the swing of blogging again. I've really missed it but i think i feel more inspired now. Thankyou for being patient..and yay, i gained followers.